As you all have noticed, I have been experimenting with mineral makeup. I love that these products are natural without tons of possibly dangerous chemicals seeping into my skin compared to traditional cosmetics. This time I got a chance to review some excellent mineral makeup products from the natural beauty care experts at Garden Botanika. I wanted to try their “She’s Flawless” Mineral Concealer, a Concealer Brush, their Cherry Lip & Cheek Stain, and “She’s a Natural” Baked Mineral Eyeshadows. Once my package arrived, I didn’t know where to start because each looked so beautiful in their case, gleaming like rich, precious jewels. However, I had to start somewhere so I decided to take out that nice sized concealer brush and dip it into their “She’s Flawless” Mineral Concealer. This product comes in one shade, which is just perfect. Better yet, is how easily the angled big brush grabbed onto the pressed concealer and worked to apply coverage that vanquished my dark circles. Next, I took out their Cherry Lip & Cheek Stain and appreciated how economical this convenient product was since it saved a consumer time and money as both a coordinated blush and lip color in one! The color was incredible as well. It was more of a deep brick red (brown-red) that blended into my complexion effortlessly with sheer healthy radiance. I also applied some to my lips and loved how this exquisite sheer color matched and felt on my lips. The “She’s a Natural” Baked Mineral Eyeshadows compact was a blast to play with. I chose the Bronze Trio and was delighted in the striking coordinated shades. This set went on like velvet, and really adorned my dark brown eyes in a magnificent way with such richness. I truly believe Garden Botanika is a great company to investigate and loved everything I tried from them so far from this mineral makeup, eye cream to their perfume. Check out their specials for great bargains or join the Garden Club for additional savings with each order. As for myself, I just can’t wait until I discover another new fantastic product in their fine line of products. 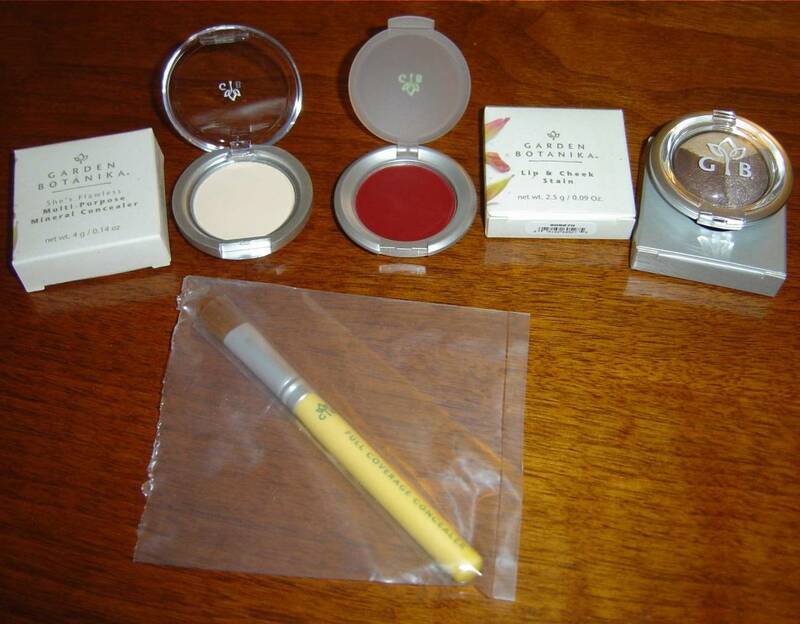 Garden Botanika has some beautiful choices for healthy makeup with their Lip & Cheek Stain in Cherry, the “She’s Flawless” Mineral Concealer, and the Concealer Brush! Check it out. Previous Post I’m Nuts About My Homemade Salad Dressings!